Apple operating system updates done the easy way. Everything you need to upgrade Mac, iPad, iPhone and Apple TV devices. Apple OS upgrades season is upon us. With the right tools and resources, you’re more than ready. Let us show you why and how you’ll be ready for the latest operating systems (OSs): with hassle-free upgrades, immediate support for new Apple features and a delivery timeline that works for you. Exciting versions of macOS (for Mac), iOS (for iPhone and iPad) and tvOS (for Apple TV) are coming soon. macOS Mojave, iOS 12 and tvOS 12 offer new productivity, security and management capabilities to help you and the users you support get more done. Your job is to get new features into the hands of users without disrupting productivity. Our job is to help you do it. Skip the rest of this page and jump right to our how-to guides for getting your upgrades efficiently crossed off your to-do list. For the rest, continue reading for a breakdown of all things Apple OS upgrades. Learn what’s new in macOS Mojave, iOS 12 and tvOS 12, and discover a path to successfully getting these new OSs and features on your users’ Apple devices. This paper examines the reasons behind transitioning from imaging, what new provisioning workflows are available, and the benefits of adhering to a more modern deployment method. Make this OS upgrade season your best one. Starting with true day-zero support. End-user productivity. New operating systems introduce features that support greater efficiency and productivity. Without day-zero support, you inhibit users from taking advantage of helpful functionality. End-user experience. Apple users expect to be able to successfully update their device(s) the day a new operating system becomes available. Day-zero support ensures this expectation is met. Alleviate security vulnerabilities. Old software is inherently less secure. With day-zero support, users can confidently upgrade and you can ensure you don’t fall prey to data breaches and system vulnerabilities due to out of date devices. More management tools. New and improved Apple device management capabilities let you customize and configure end user features based on the unique needs of your environment. Don’t miss a beat this OS upgrade season. Jamf Pro — the standard in Apple device management — gives you a powerful management solution that directly aligns with Apple and supports new operating systems from day one. With dynamic inventory tools, multiple deployment paths and the ability to leverage Apple’s security controls, Jamf Pro ensures organizational protocols are kept intact throughout the upgrade process. 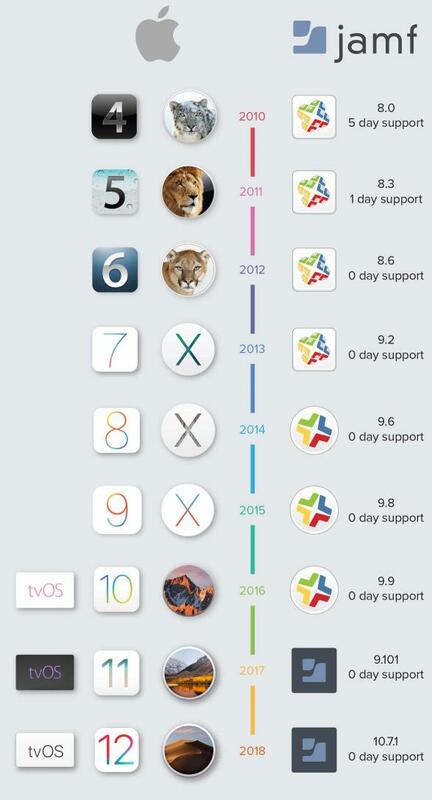 And when it comes to day-zero support, our Apple track record speaks for itself. With Jamf, never again wish that you and your users could take advantage of Apple features and functionality the second they become available. What do you get when you upgrade your Apple hardware? Select when and how to upgrade to the latest Apple OS. For macOS Mojave, utilize several upgrade models and choose to keep existing data intact or erase entirely. If you don’t want users upgrading when you’re not ready, simply block macOS Mojave until testing is complete. Once ready, push out the update via MDM or run the installer remotely using scripts and Jamf Pro. For the forward-thinking IT admin, place the upgrade in an on-demand Self Service app where users can update their device on their own. Download our simplified macOS upgrade workflow to learn more. iOS 12 updates can be triggered via an MDM command to properly managed devices. New with iOS 12, you can leverage Managed Software Updates to defer software updates for up to 90 days and choose which iOS version is deployed to users. For future Apple TV upgrades, organizations can leverage the new software update command to run the upgrade once devices are running tvOS 12. Download our simplified iOS upgrade workflow to learn more. Put our OS upgrade workflows to the test with a free trial. Want to discuss your Apple OS upgrade strategy first?